Online reservations are not currently used by this restaurant, but you can call (502)899-2008 to see if they will take your reservation. Butter ten 3 1/2-inch tartlet pans; set aside. In a medium bowl, cut 4 sticks butter into flour until mixture resembles coarse meal with bean-size bits. Drizzle in water and mix together just until dough forms—do not overwork. Roll out half the dough on a lightly floured surface to 1/8-inch thickness. With a sharp knife, cut five 6-inch circles and fit into prepared pans. Trim excess dough from rims, saving scraps; repeat with remaining half of dough. Gather and reroll scraps as needed. Place tartlet pans on 2 baking pans. Preheat oven to 325 degrees F.
In a large bowl, mix together sugar and flour. Whisk in eggs, corn syrup, and butter until combined. Mix in chopped pecans and chocolate chips. Divide mixture evenly among prepared tartlet pans. 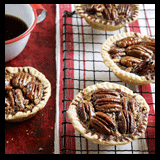 Arrange pecan halves on tops of tartlets. Bake tartlets until golden on edges and set in center, about 25 minutes. Cool on a wire rack, then chill overnight so that tartlets fully set.